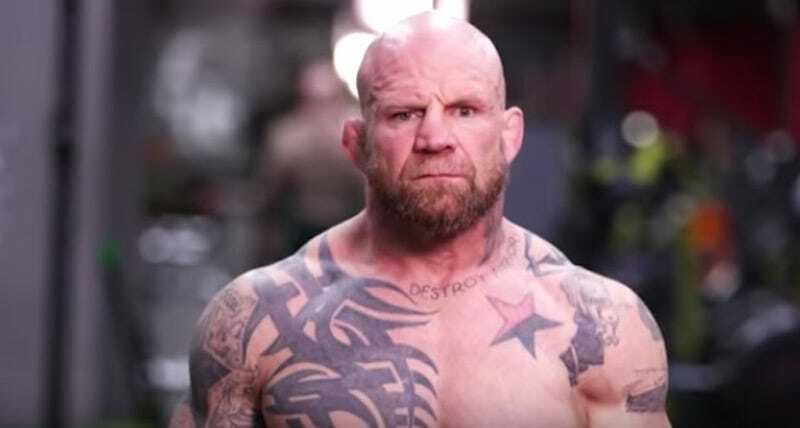 On September 9, 2018, American mixed martial arts fighter Jeff Monson became a government official in the Russian Federation. The former UFC title challenger, who was granted Russian citizenship by President Vladimir Putin less than four months earlier, was elected to a council of deputies in the city of Krasnogorsk, just outside Moscow. Video footage posted on Monson’s social media accounts showed the fighter strolling up to a Krasnogorsk polling station dressed in a hockey jersey, where he cast his ballot with the help of a translator. Despite his previous affiliation with the Communist Party of Russia, Monson was listed as a candidate under the country’s ruling party, United Russia. The switch worked in Monson’s favor. United Russia won 47.9 percent of the vote, which secured a council seat for the fighter by default. Despite the language barrier between Monson, who was born in Minnesota, and his constituents, the fighter plans to push an agenda that focuses on children, families in need, unemployment, and environmental concerns facing the city. Naturally, he also plans to introduce specific sports programs for children. “Everything I do in Krasnogorsk, I do because I love Russia,” Monson was quoted as saying following the election results on Monday. Monson’s evolution from American muscle to Russian statesman has set his career on the strangest trajectory in combat sports. His affinity for Russia and the Russian people is hard to deny, but what’s harder to suss out at this point is is whether his political activism is legitimate and capable of making meaningful changes for his constituents, or if his political career is doomed to be remembered as nothing more than a failed PR stunt. Long before Monson decided to become a professional fighter, he had already settled into a career as a child psychologist. After spending his early childhood in Minnesota and Germany, Monson received a bachelor’s degree in psychology from the University of Illinois, and a master’s degree in psychology from the University of Minnesota Duluth (UMD). During that time, he also moonlit as an assistant wrestling coach for UMD. After graduation, Monson worked as a mental health professional for several years. He specialized in crisis evaluation, as well as child and family counseling. Monson had been drawn to psychology and family counseling because of his personal experiences with his own family. Monson’s father died when he was two years old, leaving the young boy to be raised by his stepfather. A military man and a disciplinarian, his stepfather made Monson’s life difficult. His hardline style of parenting strained their relationship to the point of emotional abuse. Despite what Monson now refers to as a “difficult relationship” with his stepfather, he credits him with shaping his competitive nature in sports and forming his interest in wrestling. Monson began wrestling in high school and eventually joined the Division I team at Oregon State University. He won a Pac-10 championship for Oregon and continued wrestling for Illinois and USA Wrestling while completing his psychology degree. At the time, he did not see wrestling as a viable future for himself. This changed when he began to watch Josh Barnett and Randy Couture compete for the Ultimate Fighting Championship (UFC). Monson got himself a passport and boarded a flight to the United Arab Emirates, his first trip outside the United States as an adult. He arrived with the intention of not embarrassing himself or his coach. Instead, he defeated four Brazilians in a row to win the 88–98 kilogram weight class. His performances were so dominant that he earned the nickname “The Snowman,” a moniker that captured his wins that weekend. Much like a snowball rolling down a hill, Monson had continued to get bigger and stronger as the tournament wore on. After the event, Monson wandered through the desert surrounding the Abu Dhabi Combat Club in a daze. After arriving in the Gulf as an obscure fighter with limited grappling credentials, he would leave as one of the world’s top submission grapplers. In the span of two days in a distant land, he had achieved his competitive desires. When it came time to fly home, he boarded the plane with a calmness he had never experienced before. “I felt as though if I crash now, at least my life will be complete,” he said. Upon his return stateside, Monson began to focus on his budding career in combat sports. After trying his hand at professional mixed martial arts, he decided to give up his job as a mental health professional to maximize his potential. By 2000, Monson had compiled a 5-2 pro record and had signed with the UFC. He made his promotional debut at UFC 27, where he defeated Tim Lajcik by unanimous decision. His victory, however, was short-lived, as Monson lost to UFC legend Chuck Liddell less than three months later and parted ways with the promotion as a result. He returned two years later but was knocked out by Ricco Rodriguez. With a less-than-stellar 7-4 record, Monson decided to gain experience on the regional circuit before trying his luck in the UFC again. He compiled 13 consecutive victories between 2003-2005, claiming heavyweight titles for CWFC, XFC, and SportFight. Upon his return to the UFC in 2006, he extended his win streak with victories against Brandon Lee Hinkle, his ADCC rival Marcio Cruz, and Anthony Perosh. His impressive 3-0 run in the UFC earned him a heavyweight title shot against Tim Sylvia. The Sylvia vs. Monson title fight was the co-main event of UFC 65: Bad Intentions. Monson lasted all five rounds with the heavyweight champion but lost by unanimous decision. It was the last time that the Snowman would compete for the UFC. Following his exit from the UFC, Monson was viewed as a journeyman. He spent the next 10 years—a time period that encompassed the remainder of his MMA career—competing for approximately 40 different promotions. His fights took him around the world, including countries such as France, South Korea, Ukraine, England, Switzerland, Israel, and finally, Russia. This strange career trajectory brought Monson face-to-face with notable opposition such as current UFC champion Daniel Cormier, Roy Nelson, Pedro Rizzo, and Josh Barnett. It was during this twilight stage in Monson’s career that he came up against arguably the greatest heavyweight of all time, Fedor Emelianenko. The bout took place at an M-1 Global event on November 2011 at the Olympic Arena in Moscow, and was attended by Vladimir Putin himself. Despite suffering a broken leg during the fight, Monson survived the entire duration of the bout, losing by unanimous decision. His performance earned the respect and admiration of Russian fight fans, and helped make him one of the most popular American fighters in Russia. M-1 Global: Fedor vs. Monson will be remembered for the dramatic main event, but it was also the night where Russian MMA fans showered Putin with boos as he stepped into the ring to congratulate the fighters. Though momentarily surprised, Putin regained his composure and complemented Fedor on his impressive performance before stating that Monson was endowed with the “Russian spirit.” According to Monson, Putin had more to say the following day. Following his loss to Fedor, Monson began to fight more regularly in Russia. Despite a mixed resume and some poor performances, the American continued to gain popularity amongst Russian fans. He was recognized on a regular basis and was stopped for autographs on the streets. Much of that fandom was due to Monson’s public support for the Russian Federation, his outspoken criticism of the United States, and his political activism as an anarcho-communist. In 2015, Monson began seeking Russian citizenship. Monson would not be granted Russian citizenship until 2018, but his transition from American fighter to Russian politician had already begun. In June 2016, the Communist Party of the Russian Federation (KPRF) announced that Monson had become a special representative of the Communist Party’s sports club focused on international cooperation. The statement added that the UFC veteran would be “engaged in the implementation and promotion of the ideas of the Communist Party.” The partnership began with the KPRF sending Monson to the so-called People’s Republic of Luhansk (LPR), a proto-state in Eastern Ukraine, to develop a new sports program for children. The intent behind the program was to enhance the party’s image abroad. Well aware of the benefit of a good story, the KPRF jumped at the opportunity to enlist an American communist and athlete in their service. At the time, Monson’s partnership with the KPRF was mutually beneficial. Though Monson no longer believed that traditional communism was an applicable ideology in modern Russia, he wanted to work with the KPRF to bring about “libertarian communism.” The term refers to anarchist theory that advocates the abolition of capitalism, private property, and the state—an ideology that emerged from Monson’s disenchantment with U.S. politics. Monson’s popularity in Russia occasionally gave him opportunities outside of politics and MMA. In 2016, he was a contestant on the Russian version of Dancing With The Stars, where he danced the Rumba while dressed like a Russian aristocrat from the Tsarist empire. Monson’s switch in party affiliation from the KPRF to United Russia was a strange decision for someone who refers to himself as a libertarian communist, but it was a politically beneficial one. It was through his affiliation to the ruling party that Monson was able to secure a seat as a city councilman in Krasnogorsk (United Russia won 47.9 percent of the vote). He has since stated in various interviews in Russia that he does not represent United Russia, and plans to run as an independent in any future political campaigns, including the State Duma. It’s also been tough to figure out exactly what sort of policies Monson plans to propose. He campaigned on a platform that primarily focused on engaging Krasnogorsk youth in martial arts programs, and when he was asked a policy question after his election he spoke vaguely about working to improve the lives of “children and families” and installing a recycling program. Monson’s political inexperience is a problem compounded by the fact that he does not speak fluent Russian. This has not escaped the attention of his critics, which include former Bellator champion Alexander Shlemenko. In a recent interview, Shlemenko characterized Monson’s election as an embarrassing farce, calling the fighter a “monkey who can’t speak Russian.” To Shlemenko’s credit, it’s hard to look at Monson—a man who can’t speak Russian, just became a citizen in 2018, and performs absurd anti-U.S. propaganda skits on his state-sponsored television show, Monson TV—and not catch the whiff of a political sideshow. Monson being welcomed into Russia’s political scene was most likely due to the country’s political parties being unable to resist the allure of trumpeting a former American citizen’s transformation into a loyal servant of Russia. Their plan may have been for Monson to be nothing more than a mascot, but that doesn’t necessarily mean that Monson will play along. But before he had even departed, Monson later told RFE/RL, his Russian wife Zhenya had received an angry phone call from the Krasnogorsk mayor’s office. Monson should stick to his patch, he says she was told. He adds that he was summoned for a meeting with the mayor, but shrugged off the controversy. Monson isn’t the first aging American who has used what fame he has to achieve an elevated status in Russia, but maybe there is more behind his acceptance of Russian citizenship than Roy Jones Jr.’s or Steven Seagal’s. Monson really does seem to have a respect and affinity for the Russian people, and he now permanently resides in Krasnogorsk with his wife. Vladimir Putin has made a point of collecting famous American playthings, but if Monson continues to be willing to stand up to powerful people on behalf of the citizens who elected him, he doesn’t have to be the next one in Putin’s collection.